If you are looking for information on the Sweet Factory franchise business opportunity, Sweet Factory franchises or Sweet Factory franchising, then you have come to the right place. Thank you for your interest in Sweet Factory franchise opportunities. Please read on and explore the links on this page to learn more about owning your own Sweet Factory franchise! Mixing entertainment and excitement with high quality offerings and bright colorful stores, Sweet Factory has captured significant market share in bulk candy retailing, one of the fastest growing retail phenomena sweeping the country! We are THE "Candy Authority," executing a winning formula for retail success that sets the standard for bulk candy retailers. Advance our leadership position as America's dominant candy retailer by providing great service and quality product in a dynamic store design while steadily increasing sales from our expanding core business and strategic partnerships. 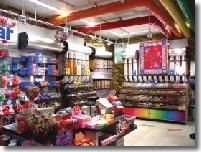 Country's largest bulk candy retailer: "America's Candy Store"
Store design adaptable to multiple venues (malls, kiosks, airports, sports arenas, entertainment centers, etc. Candy is an American "way of life!" Each American will consume an estimated 25 pounds of candy every year, contributing to a $24 billion dollar industry growing at a projected 5% per year over the next 5 years. 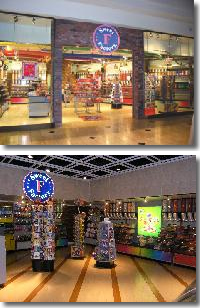 Our candy stores appeal to kids (and adults!) of all ages and over 95% of them will return within a calendar year. 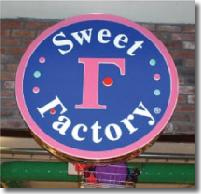 Sweet Factory is the best-financed bulk candy specialty retailer in the country with strong annual growth rate in high traffic retail locations! We will continue our leadership role in the "pick and mix" candy industry by focusing on quality, freshness, and up-to-the minute candy trends! Our extremely effective one-price system and our introduction of branded chocolates have taken us to new heights of retail marketing. Sweet Factory's goal is to become the dominant specialty candy retailer and "brand" by placing stores in prime retail locations across the country. We are extremely well positioned to carve out an even larger share of this unique $24 billion opportunity. What Separates Sweet Factory from its competitors? It's not just the bright, colorful, fun-to-shop stores. We have the best selection of the most in-demand candies, including bulk, count gods, candy-related gifts, sugar-free and kosher products. We can source the most in-demand and unique products because of our volume. Our one-price format, colorful self-serve bins and well- conceived merchandising planners make our products pretty hard to resist.